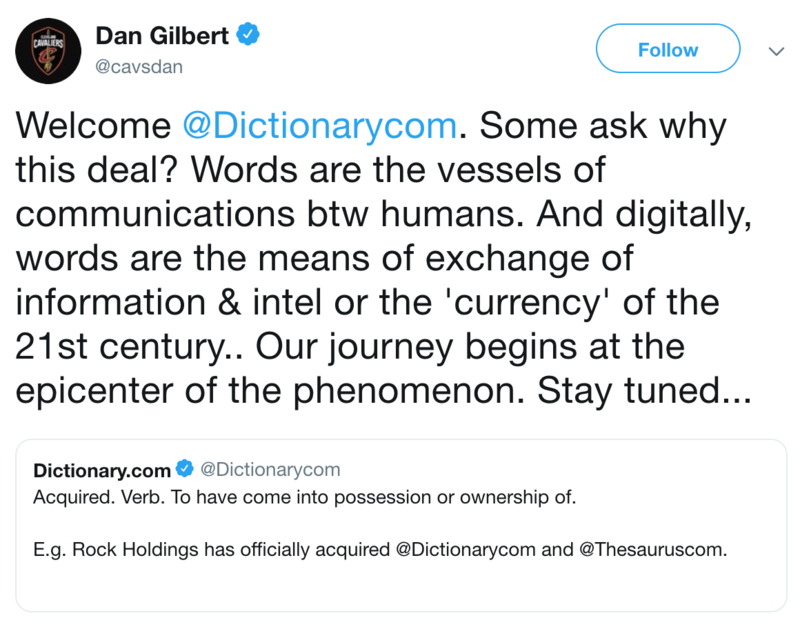 DETROIT, November 15, 2018 – Detroit-based Rock Holdings, Inc., progenitor to considerable FinTech and other online enterprises, inclusive of Quicken Loans – the nation’s largest mortgage lender – today disclosed the acquisition of Oakland, California-based Dictionary.com and Thesaurus.com in accord with their begetter, IAC. These forums are the nation’s preeminent online erudition resource and information concourses, eliciting in excess of 540 million page explorations per approximate lunar cycle. Established in 1995, Dictionary.com and Thesaurus.com hold notorious for engendering consequential network exchange and assignation as the globe’s copious digital-forward English lexicon and onomasticon, pro rata. Their technological infrastructure has been pivotal in accommodating an agglomeration of recrudescing global patrons with incorrupt entrée to a multiplicity of delineations, equivalencies, phonic syllabifications, precedent sentences, transliterations and the facilitation of orthographic study. Likewise, the gamut burgeons clear of cyberspace, exceeding 110 million digital utility downloads from antiquity to the present day for consumers to promote the analysis of words originating at the interior of the individual’s own metacarpus. The annexations of Dictionary.com and Thesaurus.com append a prodigious coterie of inestimable content proprietaries to Rock Holdings and its affiliated companies such as Rocket Mortgage, ForSaleByOwner.com, LowerMyBills, StockX, Cleveland Cavaliers, Robb Report, and Genius, among others. As a consortium that emulates a For-More-Than-Profit ontology, Rock Holdings and affiliates are fixated on expenditures in steadfast quarterage, scholarship and vocation in its hometown municipalities of Detroit, Cleveland, Phoenix and Charlotte. The new titleholder of these enterprises, foresees an explosion of innovative and creative functionality, products and integration opportunities that will propel this enterprise into leading a viral era of knowledge expansion and communication skill development across the nation from preschool well into senescence. Dictionary.com and Thesaurus.com retain upwards of 50 contingent partners situated in Oakland, California – with approximately 75% concentrated on product and engineering. The stipulations of the procurement remain unavailable. Rock Holdings Inc. is the parent company of several FinTech businesses. These companies include Quicken Loans, America’s largest mortgage lender, its subsidiary One Reverse Mortgage, and Quicken Loans Mortgage Services (QLMS), a tech-enabled mortgage origination platform and division of Quicken Loans serving community banks and credit unions across the country; Rocket Homes, a digital platform matching clients with high-quality pre-screened real estate agents nationwide; RocketLoans, the fastest online personal loan platform in America; and Rock Connections, a national strategic marketing company specializing in outbound and inbound client service for numerous online, technology and other businesses, among others. Rock Holdings Inc. is headquartered in Detroit, where its companies employ more than 17,000 team members. Brilliant stuff from brilliant creative teams at Rock Holdings and Dictionary.com. As for the stipulations of the procurement, Ben Lane over at HousingWire estimates Rock Holdings paid $100m based on IAC telling investors they would sell Dictionary.com and TV production firm Electus for $130m, and Deadline’s Nellie Andreeva reporting Electus was acquired for $30m.